As I sat in the grimy public washroom, with tears streaming (I mean streaming like a waterfall) down my face, I really was not sure why it was that I was crying. All that came to my mind was the verse from childhood, about sticks and stones, but not one person said one word to me. All I can say is that my heart felt like it was broken, heavy, grieving by what I had heard. It had been a chaotic week for hubby and I and our kids had all gone in different directions, so we decided to check out a restaurant that we had never tried before. The words felt like a jab to my heart. The man continued, for what seemed like a painful amount of time, sharing stories of ministers, priests, and people of many faiths who were hypocrites, not practicing what they preach. Though he was equal in his disdain for people of any faith, he seemed to be particularly hateful to those who called themselves Christian. I sat there, the blood seeping from my face, the pain of a death by a thousand verbal cuts touching every part of my being. The tears welling in my eyes. It was then that I excused myself to the washroom, to try to pull myself together. I really was not sure why I was crying. That man didn’t know me, I didn’t know him, yet we were both part of his bitterness, of my sin. I have no idea how he has been hurt by faith, or, more likely, people of faith, but I know his vile attitude, and I know that his problem is not faith, not even Christ, but Christians. I was aching, mourning, because the words of that man in the restaurant were the weight of our sins … how we destroy the name of Christ in how we treat others. Because it is the pain and burden of carrying our sin that Christ bore, that Christ bears. 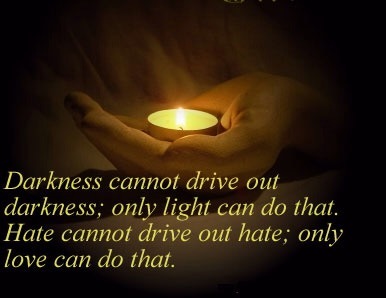 so that we can be instruments that drive out darkness and hate. I don’t often re-post but this really resonated with my own heart. 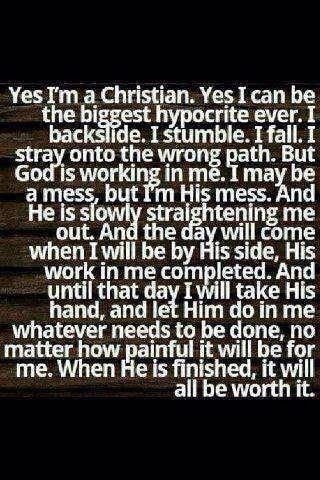 I pray it will be a blessing to those who may read it also.